The material can be made in detailed patterns. 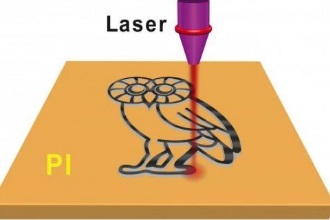 For show-and-tell, the Rice team patterned millimeter-sized LIG Owls (the school’s mascot), and for practical testing they fabricated microscale supercapacitors with LIG electrodes in one-step scribing. The labs of Rice chemist James Tour and theoretical physicist Boris Yakobson published their research online today in Nature Communications. “This will be good for items people can relate to: clothing and wearable electronics like smartwatches that configure to your smartphone,” he said. This top-down approach to making graphene is quite different from previous works by Tour’s lab, which pioneered the small-scale manufacture of the atom-thick material from common carbon sources, even Girl Scout cookies, and learned to split multiwalled nanotubes into useful graphene nanoribbons. But as in the previous work, the base material for LIG is inexpensive. “You buy polyimide flexible plastic sheets in huge rolls, called Kapton, and the process is done entirely in air with a rapid writing process. That sets it up for a very scalable, industrial process,” Tour said. Tour said the resulting graphene isn’t as conductive as copper, but it doesn’t need to be. “It’s conductive enough for many applications,” he said. He said LIG can easily be turned into a supercapacitor, which combines the fast-charging, power-storing capacity of a capacitor with the higher energy-delivering capability, though not yet as high as in a battery. The defects could be the key, Tour said. Calculations by Yakobson’s group showed that these balancing five-and-seven formations make the material more metallic and enhance its ability to store charges. “Theoretical methods and density functional computations allowed us to look inside the electronic energy states’ organization,” Yakobson said. “What we discovered is that the very low density of available states — which is crucial for the layer capacitance — increases dramatically, due to various topological defects, mainly pentagonal and heptagonal rings. “The fact that highly defective graphene performs so well is a freebie, a gift from nature,” he said. Tour’s lab used the machine shop lasers at Rice’s Oshman Engineering Design Kitchen to create their robust microsupercapacitors. The best results showed capacitance of more than 4 millifarads per square centimeter and power density of about 9 milliwatts per square centimeter, comparable to other carbon-based microsupercapacitors, and negligible degradation after as many as 9,000 charge/discharge cycles. This capacitance is sufficient for inexpensive wearable electronic devices, and Tour said his group continues to make improvements. Co-authors are Rice graduate students Zhiwei Peng, Yuanyue Liu, Ruquan Ye and Errol Samuel; and Francisco Ruiz-Zepeda, a researcher at the University of Texas at San Antonio. Yakobson is Rice’s Karl F. Hasselmann Professor of Materials Science and NanoEngineering, a professor of chemistry and a member of the Richard E. Smalley Institute for Nanoscale Science and Technology. Tour is the T.T. and W.F. Chao Chair in Chemistry as well as a professor of materials science and nanoengineering and of computer science. The Air Force Office of Scientific Research and its Multidisciplinary University Research Initiative (MURI), the Office of Naval Research MURI, the National Center for Research Resources, the National Science Foundation Partnerships for Research and Education in Materials and the National Institute on Minority Health and Health Disparities, part of the National Institutes of Health, supported the research.